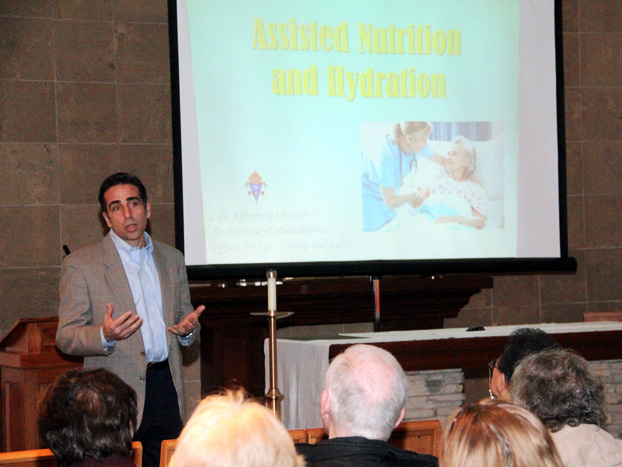 Bobby Schindler spoke Sunday, March 9 at St. Vincent de Paul Parish in Richboro, Bucks County, on the topic of assisted nutrition and hydration. He is the brother of Terri Schindler Schiavo , the woman who died in 2005 after her feeding tube was removed by court order while she was in a persistent vegetative state. He is also executive director of the Terri Schiavo Life & Hope Network. Schiavo’s talk explored whether discontinuing medically assisted nutrition and hydration could cause one’s death or the death of a loved one. The seminar was designed to help families decide whether or not to continue with assisted nutrition and hydration in light of the dignity and value of the human person and Catholic moral teaching. The talk was part of the Life Affirming Choices series offered by the Archdiocese of Philadelphia’s Office for Life and Family, which examines end-of-life issues in parish-based presentations. St. Vincent’s continues the series with talks on March 16, 23 and 30. Steven Bozza, director of the Office for Life and Family, conducts the series at SS. Peter and Paul Parish, West Chester, on March 13, 20 and April 3. The series will also be offered at St. Norbert Parish, Paoli, on April 22, 29, May 6, 13 and 20. Contact Bozza at 215-587-5661 or via email at sbozza@archphila.org to learn how your parish can host the series, or visit the office’s website at PhillyCatholicLife.org for more information. A national memorial Mass marking an “International Day of Prayer and Remembrance for Terri Schindler Schiavo, and All of Our Vulnerable Brothers and Sisters,” will be celebrated by Archbishop Charles Chaput on Monday, March 31 at 5 p.m. in the chapel of the Cathedral Basilica of SS. Peter and Paul in Philadelphia. All are invited and encouraged to attend. Read more about the Mass and related events here. 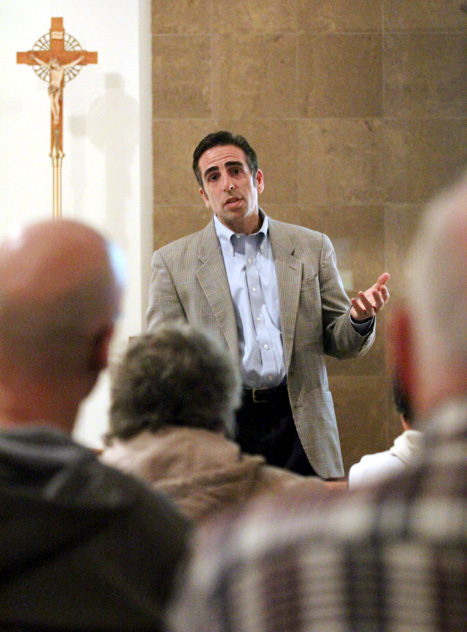 Guests at St. Vincent de Paul Church listen to Bobby Schindler speak on end-of-life issues.